Stop & Shop advances to brink of building permit with unanimous vote. Edgartown’s planning board tackled both the Upper Main Street Stop & Shop expansion and the Chappaquiddick wireless tower Tuesday night. Deliberation on conditions for the Stop & Shop project proved genial, and finished with unanimous board approval. The board’s decision puts the project on the doorstep of the building permit process. Meanwhile, a do-over hearing on AT&T’s bid to erect a 10-story tower in Chappy’s Sampson Avenue neighborhood grew contentious during the commentary period, to the point where one member of the audience was threatened with ejection. The renewed process to evaluate the tower was triggered after AT&T found legal fault with an alternate member of the planning board, James Cisek, voting on the tower after not attending all the hearings. Prior to the tower hearing, planning board members weighed, and at times tweaked, a long set of conditions for Stop & Shop’s proposal to enlarge its supermarket. Vineyard attorney Geoghan Coogan represented the grocery chain, and was called upon repeatedly to field questions from the board. Among the conditions stipulated was a sound-absorbing fence around the truck loading area meant to reduce noise by 10 decibels, a bus shelter that will “complement or enhance” the Rockland Trust building, and traffic analysis and monitoring for a year. Planning board assistant Georgiana Greenough read into the record a letter from Edgartown attorney Ben Hall, who argued the “high parapet walls” and 20-foot roof at the back of the intended building will cast undue shadow on abutting Hall family property. Coogan responded to the letter by stating Shop & Shop won’t propose changes to the building, but was willing to entertain a shadow study. Fear of recreating circumstances that led to the tower do-over filtered into the proceedings when board member Fred Mascolo informed chairman Sam Sherman he had missed two meetings for medical reasons. Planning board clerk Doug Finn told Sherman he was confident Mascolo hadn’t missed any “substantive” meetings or hearings and could vote on the Stop & Shop project. Sherman wasn’t taking any chances. He called a 10-minute recess and instructed Finn to head upstairs to the planning board office and examine records to verify Mascolo was present when necessary. Finn did so, and the board subsequently voted to approve. 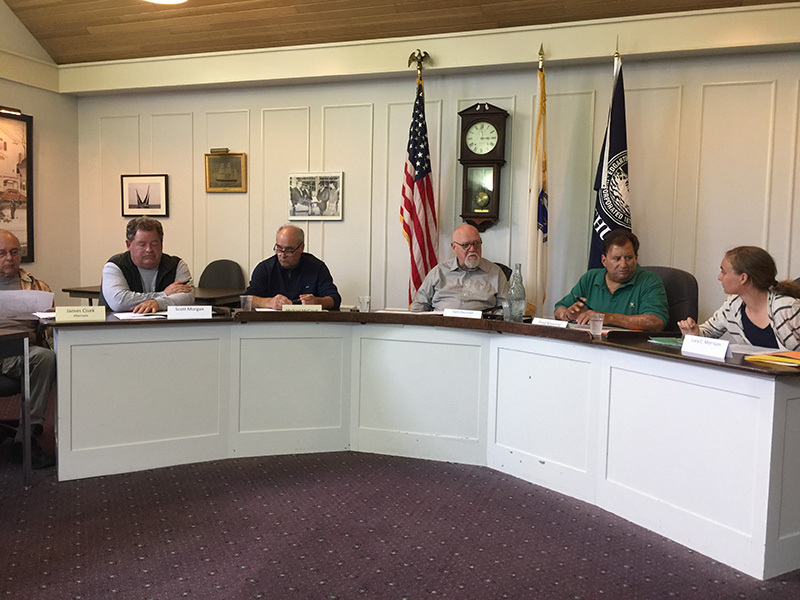 The planning board now has 14 days to sign its decision and receive a stamp from the town clerk, Greenough said Wednesday. Thereafter begins a 20-day appeal period. If no appeals surface, the decision will be recorded in the Dukes County Registry of Deeds and the building department can then consider a permit application. The board began its hearing for a 115-foot wireless tower at 14 Sampson Ave. with a presentation by Boston attorney Arthur Kreiger, who represented AT&T. Krieger explained the site choice was narrowed from 400 to three: 14 Sampson Ave., 2 Majane Lane, and 14 Jeremiah Rd. Lease options were taken on all three locations, he said. The Sampson site was ultimately determined the best, he said. Krieger outlined the faults of the other two “alternate” lease sites. For Majane he highlighted poor coverage potential and a sea change in the owner’s disposition. “There’s been a change of circumstances regarding Majane,” he said. AT&T holds an option until 2019 on the property, and was recently informed by owner Paul Majane he will not renew the lease. “He received a call from an anonymous attorney awhile back threatening that if he did move forward, he would face a lawsuit,” AT&T agent Dan Bilezikian said. Bilezikian also said Majane’s son planned to build a house on the site. Greenough read into the record a letter in support of the tower from Edgartown Fire Chief Alex Schaffer. Schaffer wrote that the temporary tower presently aloft has already improved 911 coverage. The proposed tower, Schaffer wrote, would further enhance emergency communications and facilitate FirstNet capabilities. Edgartown IT manager Adam Darack came before the board and furthered Schaffer’s argument by pointing out that AT&T had granted permission for the police and fire departments to affix radio equipment to the tower. Hanley Clifford, a Chappy resident, displayed a scar on his leg from a chainsaw accident. He credited a 911 signal channeled through the temporary wireless tower with saving his life. “We need this [tower] desperately,” he said. Krieger told DiMattia the Telecommunications Act prohibited communities from considering tower emissions provided the tower adheres to Federal Communications Commission regulations. DiMattia appeared flabbergasted that a public safety issue for his neighborhood couldn’t be talked about, and went back and forth with Sherman and Krieger on the issue. “We can’t discuss that? We’ll bury that?” he said. Sherman told DiMattia if he didn’t stop belaboring the subject, he would be asked to leave the hearing. Teresa DiMattia, a lifelong resident of the Enos Lots, advocated for relocating the tower. “I just don’t understand why with all this contention in a neighborhood with 23 homes within 500 feet of this tower, why are you shoving it down our throat when there is another place?” she asked. “It can go on Jeremiah,” she said, pointing out that very few homes are in the same radius there. Enos Lots resident Dia Trancynger said she thought AT&T selected the Sampson Avenue site not because it offered the most coverage but because it was the most economic for them. “Our neighborhood was fine with the temporary tower. We are not fine with fine with a 120-foot, four-tiered, 63 radiation centers — no, we can’t talk about it — but we’re not fine with that,” she said. Rob Strayton, a sharp critic of the project during past hearings and husband of Dana, asked the board to “consider the impact” of the tower, and asked the board if the site was appropriate. “We’re talking about erecting a 10-story tower,” he said. The hearing exceeded its two-hour threshold, and was continued to July 10 at 5:30 pm.